Sitting in traffic can be as time-consuming as it may be frustrating. 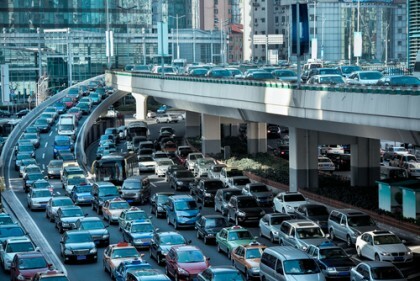 And while many commuters regularly battle with traffic to get to and from work, school, etc., commuters in some regions of the country may be burning far more time and fuel in traffic jams than others, according to the findings of a recent study conducted by the American Highway Users Alliance (AHUA). This study, Unclogging America’s Arteries 2015 :Prescriptions for Healthier Highways, analyzed vehicle speed data (the same type of data used by federal transportation regulators) to rank “the 50 worst highway bottlenecks across the nation, highlighting the benefits of improving the top 30.” The goal of this research, according to the study’s authors, is to address the regions of highways that have the biggest negative impacts on the U.S. economy, the environment and motorists’ quality of life. The worst areas for traffic jams in the U.S. are primarily located in the nation’s largest cities. The single worst traffic jam occurs in Chicago, on the Kennedy Expressway (I-90) between the I-290 and the I-94. The reason that this is the worst traffic bottleneck is that motorists commuting on this highway generally experience the longest waiting times and the longest backups. Each year, this bottleneck consumes about 17 million hours of commuters’ time. Six of the top 10 traffic bottlenecks were located in Los Angeles. Of the top 30 listings, L.A. highways were featured 11 times. This means that about 1 in every 5 of the worst traffic bottlenecks in the nation is located in the Los Angeles area. Five of the listings within the top 30 were located in New York. The I-35 highway in Austin, Texas was ranked 10th on the worst traffic jams list. The I-5 in Seattle, Washington was ranked 17th. About $39 billion could be saved over about 20 years. About 35 million gallons of gas could be saved each year, reducing CO2 emissions by about 740 million pounds. Over 20 years, this could result in about 830 million gallons of fuel being saved and about 17 billion pounds of CO2 being preventing from being released into the environment. One proposed solution for “fixing” the top 50 worst traffic jams in the U.S. is to develop better highway infrastructures (rather than more mass transit systems). What do you think about this study’s findings? Share your opinions with us on Facebook & Google+. If you have been hurt in a traffic crash, you can rely on a Portland car accident lawyer at the Savage Law Firm for experienced help and aggressive legal advocacy. Since 1977, our lawyers have been devoted to providing each of our clients with personal attention, respect and the highest quality legal services.